Easter lilies make a great gift for a family member or a teacher. 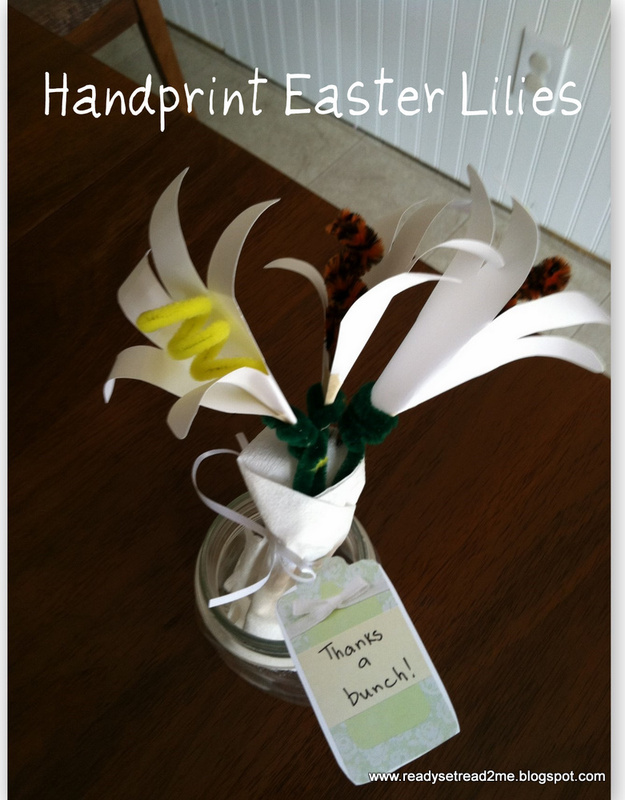 These handprint lilies will last for more than one spring season and they are great crafts for preschoolers. We made bouquets of these handprint flowers to give to the nursery workers that watch the boys every week while I attend Bible study. Each teacher got a bouquet of flowers with a tag that said, "Thanks a bunch". To make these flowers, trace your child's hand and cut out. Use a pencil to curl the "fingers" outward. Meanwhile, curl a pipe cleaner around a pencil. Roll the hand into a cone shape and hold. Slip the curled pipe cleaner into the center of the flower. Slip a straw into the base of the flower. Staple all three together. Making these flowers, reminded me of one of my favorite Easter books, The Parable of the Lily by Liz Curtis Higgs. A little girl, Maggie, receives a gift in the mail... a crate of dirt. The girl is less than thrilled with the gift. She is told to put it away in a dark corner. She mostly forgets about it. Her father, the farmer, does not forget, he had given the gift to the girl. Eventually even the bulb is deemed useless and gets thrown outside. On Easter morning, Maggie wakes up early. She goes out to the garden to look for some pretty easter flowers. She finds an Easter lily surprise! There is a white, fragrant flower. She can't believe the gift is alive! She realizes that beauty came out of a box of dirt. Her father forgives her for throwing out his gift. He tells her that is what Easter is all about-- forgiveness. This is a sweet story that is perfect for spring and Easter. The illustrations are adorable. Each page also has a scripture verse which subtly draws the connections between the players in the book and God the Father, God the son, and the world in the Biblical Easter story. This book can be enjoyed by young preschoolers but the message of the story would probably be better understood by early elementary school aged children. At our house, we are getting ready to celebrate the week of Easter starting with Palm Sunday today. I hope that you have a beautiful Easter season celebrating the good news that God's not dead, he's surely alive! (Just like the lily in the story). We are crafting up a storm and most of the ideas are pinned to my Spring Pinterest board! Also, there is a virtual book club for the book, The Easter Egg by Jan Brett. There are tons of ideas linked up, come check it out. I saw this book on other blogs too - maybe we will get it next year. Your lilies turned out wonderfully! These are so cute! I think I may make some with my littles today! Thanks for the idea. I love the handprint lilies - so pretty! That book sounds lovely, too. How sweet! I love handprint projects. Love the book (I think I remember reading something similiar to it), what a sweet story. And I love the craft, so pretty! thanks for sharing this on Hey Mom, Look What I Did at Adventures In Mommy Land...hope to see you again sometime! These are so cute! We are planning an Easter tea party for the Grandmas and these will be perfect on the table! I love handprint art-acrafts!! These lilies look lovely. Thank you for linking to Kids Co-op and hope to see you again next week! How fun! We've done these before, but I love the idea of giving them to teachers at church!